With Labor polling a dismal 29% ,the world economy in ruins and even with senior Labor people like the Leader of the NSW opposition refusing to support the carbon tax Gillard is still "moving forward' with this bizarre impost on the Australian nation. Although the Gillard Government insists that they are proceeding in concert with the rest of the world the reality is far different ,as described in an excellent WUWT article by Ed Hoskins which is reproduced in full here. The developing world is ‘not joining-in with CO2 emission reductions nor does it have any intention of doing so. So the whole warmist idea is a creature of a limited number of developed western nations whose governments have been persuaded by the control Global Warming / Climate Change / Climate Disruption agenda. 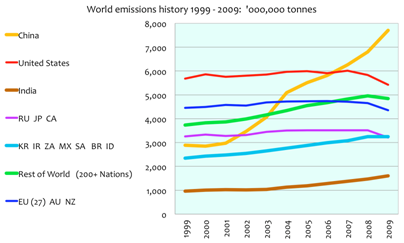 These notes using information on emission levels by nations published by the Guardian and Google  re-emphasize Professor Muller’s initial point. China questions the role of man-made CO2 in determining climate effects and is now the largest CO2 emitter, having surpassed the USA in 2006, and is now greater than the USA by more than 40%. China completes a new coal-fired power plant each week. China has made the gesture of being willing to link the intensity of its emissions to be dependent on its GDP growth. In effect this is no concession at all . India has set up its own climate institute to re-examine the claims and policy recommendations made by the IPCC and grew its emissions by ~9% in 2009. It too has said that it will comply with the intensity criterion. Also in effect this is no concession at all. The well-developed nations Russia, Canada and Japan have already withdrawn support for the Kyoto accord. Iran, Saudi Arabia, South Korea, Mexico, South Africa, Brazil and Indonesiaare the larger developing nations do not support action on Man-made Global Warming, and they will continue their rapid growth of CO2 emissions. The “Rest of the World” (200+ Nations), ~19% of world CO2 emissions and ~40% of the world population, mainly consist of some 200+ underdeveloped or developing nations. They are not interested in limiting their emissions nor in restricting their slowly improving standards of living. But they are expecting to be the financial beneficiaries at the expense of the ‘developed nations’ of the ‘western Climate Change process’. and thus to terminate any USA response to mitigate Catastrophic Anthropogenic Global Warming. The USA congress has just mandated that all support for “Green” international activities should be terminated. A failure to commit by USA adds about 18% to the current world emissions not falling under the influence of any CO2 controls. The withdrawal of the USA would then mean that about 85% of world emissions and 92% of the world population were no longer involved in any action on controlling CO2. An opt-out by the USA leaves the European Union, Australia and New Zealand isolated in their continuing adherence to the Man-made Global Warming assertion. It is only in the EU, (including the UK, ~1.7% of World CO2 emissions or ~11% of EU emissions), as well as Australia and New Zealand where their governments have committed action on CO2 into legislation. These isolated nations are about 8% of the world population and only~14% of the world’s CO2 emissions at present. The failure of universal action entirely negates the unilateral action of any individual nation. So the realistic apparent position based on current published CO2 emissions is shown below. So these adherent nations have isolated themselves by their own self-emolliating actions on the basis that it is their duty to show an example to the rest of the world. However their actions alone can only ever effect virtually undetectable reductions of world temperature. Other dissenting nations may pay lip service to the efforts of the United Nations and the IPCC but they are certainly not going to change their attitudes and damage their economies in the same manner. This is the stark reality of the majority of national attitudes, which are opposed to the present views of the United Nations as represented by the UN IPCC, the EU and Australian and New Zealand governments. 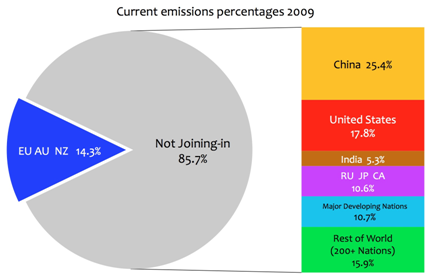 The UK contributes only 11% of the emissions in this active group amounting to ~0.00224°C by 2100. Australia contributes even less and its actions might amount to ~0.00177°C by 2100. But growth of emissions from developing countries including China, India and other underdeveloped nations continues. China is predominant and India is following on probably at a greater future rate but to a lower absolute extent by 2100 . According to the Guardian / Google data the following graph shows the emissions growth over the past 10 years. And shown below are the percentage increases both for the last ten years since 1999 and also the annual rate of increase 2008-2009. 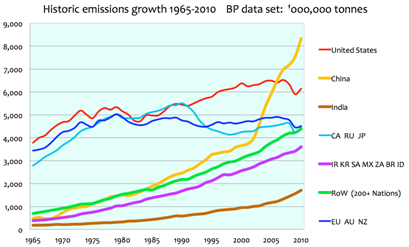 A further useful alternative perspective can be seen in the long-term CO2 emissions data recently published by BP up until 2010.
the recent accelerating advance of emissions from India, a nation which has very substantial potential for further emissions growth from a very low base. This graphic also shows a leveling out of developed economies but with an uptick in 2010 as they recover from the recession of 2009. The historic figures of CO2 emissions set out here show clearly that China, India, the “major developing nations” and the “rest of the world” are clearly not joining-in the action on CO2 emissions reduction. These increases in emissions will totally negate any efforts, however strenuous, of the developed world where emissions are already significantly stabilized, even in the USA. It is clear that the failure of worldwide universal action will entirely negate the unilateral action of any individual nation or groups of nations. Any effort is therefore a total folly and the sooner this is realized, in spite of the huge academic and monetary capital already invested, the sooner the western world can be released from its self-imposed economically destructive straightjacket.